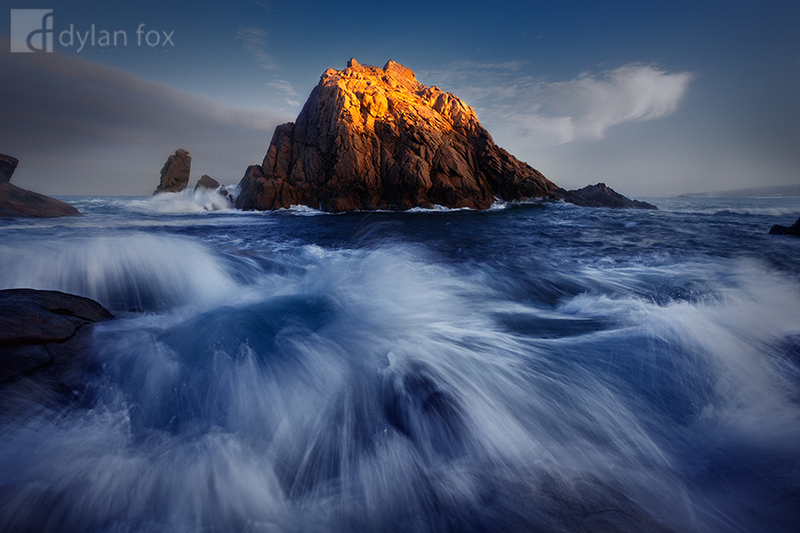 It took a number of attempts to capture this Sugarloaf Rock photograph. I had this idea of capturing Sugarloaf Rock as the mornings first light reached over Cape Naturaliste and hit the top of the rock. My first attempt went fairly well. I had big swells, great light, but no clouds. I returned about a month later and on the first morning had the light, but not enough swell or clouds. The following morning I was feeling confident and when I arrived to see the conditions, I was thrilled. Big swell and clouds in the sky. When the light hit the rock I was wrapped! This particular frame I am so happy to have captured. Being setup near the water and low with my wide angle lens can always be risky. This particular wave nearly swept me and my gear in for a swim. As it crashed I hit the shutter and as soon as it finished lifted the tripod up in the air and held on to some rocks. I didn't realise I had captured this until I got home. Waiting for these to return and hopefully have conditions line up was all worth it! Secure your limited edition, Sugarloaf Rock photographic print, 'Sun Kissed', by selecting your desired print size in the menu to the right.